Our host in the Hotel Zum Alten Fritz was a local character, Wolfgang, who is pretty keen on military history. He had many historical photos of the town of Letschin, in war and flood, as well as Frederick the Great memorabilia. My bike had a problem as the bolt holding the pannier racks on had sheared off, so we set about looking for a bike shop. 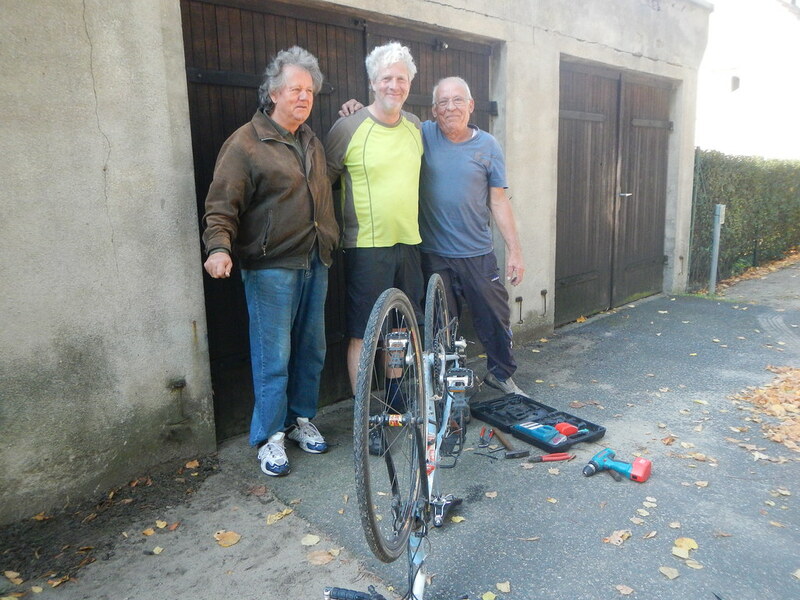 As we arrived in the town of Neuhardenberg, we found an open door, some bikes on the street and some old blokes and so we stopped to see if they could help out. They were only too happy to do so, although not in the German tradition of fine engineering. Their approach consisted of power tools – drill and angle grinder (the latter fortunately was not used), nuts, washers and bolts, and enthusiastic application of these to solve the problem. It all worked out ok in the end. We had a similar situation 4 years ago in Hungary where blokes unexpectedly came to the rescue. I say we should have the International Day of Old Blokes – they need more recognition. After this kartoffelpuffer and kuchen (kase mohle und pflaumstreusel) were needed and these were obtained in Buckow. This town also has a lake, a public chess set and moderately aggressive swans. We swam in another nearby lake – the water was pretty cold at first but the experience was definitely to be recommended. Die Pyramid is a folly of the 18th century that has recently been restored from a ruin. We visited it as it was on our route but do not especially recommend it. This is because it is plain ugly and even when you climb to the top, which is verboten but we did it anyway, all you can see is trees, trees and more trees in all directions. We do recommend Peetzsee and intend to test its suitability for swimming in the morning. Today has been our warmest and sunniest day so far and tomorrow promises to be that same. We are heading for Berlin! The blokes and the bike! This entry was posted on 4 September 2014 at 8:26 pm and is filed under Europe 2014. You can follow any responses to this entry through the RSS 2.0 feed. You can leave a response, or trackback from your own site.